Reflections on my childhood | Welcome to allaboutwordswa! I was born in 1954. That sounds like a long time ago – 57 years and I will be 58 in November 2012. I am the youngest of five children – Mum had five children under ten years of age. She had a career in Nursing, worked shift-work, kept a spotless home as well as bring up five children. She was a hard act to follow! Mum polished our lino floor on her hands and knees, with a cloth and a tin of Wonder Wax (polish). To shine the floors we kids would put our socks on and do skids on the floor until it came up shining. Things were tight financially. We often didn’t have luxuries like tooth-paste but would give our teeth a good scrub with salt on the toothbrush! I didn’t ever feel that I went without anything. Mind you, my brothers and sisters would probably say I was spoilt, being the baby in the family. Meals were always plain and simple – chops or sausages with carrots, potatoes and peas or beans. Often we had stew, which was basically mince meat and vegetables cooked together in a pot. Mostly the veggies were fresh – I used to love shelling the peas and eating them raw. Mum made home-made ice-cream served with stewed fruit from the trees in the garden. All us kids were sent to the local Catholic Primary School. My parents had no interest in the church however, when they married in the Catholic Church, they promised to send their children along and bring them up in the Catholic faith. I must admit it was confusing to get so much indoctrination at school and no support for it at home. Maybe that explains how I became a rebellious Catholic as I don’t have any association with it today (apart from the guilt that most Catholics would understand). We had a big block of land at home in my small country town in Northern Victoria. It was an era when kids could run free and feel safe and secure in the townsite. We had a swing in the yard – a home-made one of course! We played a lot of skipping games. I wish I could enjoy it today like I did then. Ball games were also BIG. 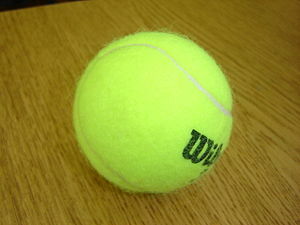 There were tennis balls, rubber balls, inflatable ones, solid rubber ones and ping-pong balls (as in table-tennis). We also had a large choice of bats. Combine the bats and balls and there were endless hours of entertainment. I loved bouncing balls and creating clever games like you might find at a circus. And speaking of clever, having a yo-yo was a real cool thing to show off with. We played a lot of card games such as Fish, Snap, 21 and Memory. They usually ended up in tears because we accused each other of cheating! Another game we loved was Hoppy. We drew a pattern of squares on the concrete with chalk and you had to move [a shoe polish] tin of sand from one square to the other. Even though I had two brothers, it didn’t stop me playing with girlie toys as well – I always had a doll in a pram and played lots of pretend games where we would dress up in our parents’ discarded clothes and shoes. This usually involved building a cubby house as well – this was our pretend home. We practised our future role as house-wives and mothers! I hadn’t heard of women’s liberation then – even though Mum worked full-time! We didn’t have a gramophone for playing records but my friend’s Mum did and we used to play records (on the quiet, as we weren’t allowed anywhere near it). Radios were the main source of entertainment. Ours was a big brown one that sat on top of the fridge. Kids had to be quiet when the news was on. I remember standing in the kitchen and hearing the terrible news that President Kennedy was shot and was dead! It was a defining moment, like many more that were to come. “How could such dreadful things happen?” my childish mind asked. The world didn’t seem quite the same after that event. Some things have changed so much since that time (technology in particular), but many remain the same as we haven’t mastered being able to live in peace with each other. I live in hope that we are making progress and our global communication enables us to have a better understanding of different cultures and practices. The recent Occupy Wall Street was an example of people seeking change, tired of the old order of greed and self. I think it is a positive sign. Thanks frizztext for your comments! Games sure have changed a lot since then. Mostly kids don’t leave the couch these days.. Come to think of it, I hardly did either! Born in 1952 I especially enjoyed reading your reflections on childhood. We played outside, unsupervised, all the time. Bikes and in the woods with rotten logs pretend deer meat if we were pioneers. It is fun to visit childhood memories – things have changed a lot over the years. No doubt that will continue for each generation. It sounds like you and your family enjoyed the blessings of the simple life. In my experience, when you have less money, it seems like you have more of the important things. Which games were your favorite? Thanks for visiting and leaving some comments. You asked what was my favourite game as a child – interesting question – I guess I would have to say that ball games were at the top of the list. Even as a teenager I played netball and basketball.